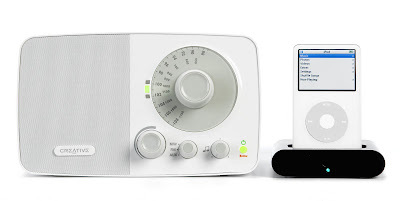 Creative SoundWorks Radio 705 is a radio in classic retro style and has a full-range speaker with bass port delivers dynamic sound with strong bass. There is a cable to connect other audio devices such as MP3 players or notebook PCs using the cable supplied. Besides, there's also an optional iPod dock gives full control of an iPod via the included remote control, charges the player and provides excellent sound via the radio's speaker.